A Thai spring is one of the most sweltering, humid experiences on Earth. As soon as the sun rises you feel beads of sweat bloom on your forehead, and at any moment a thunderstorm may just blow up the sky. 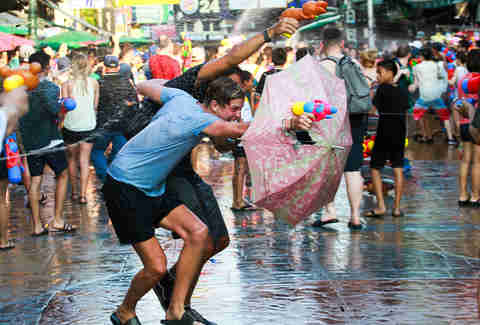 This is partly why every spring in Chiang Mai, Thailand's former northern capital, throws the world’s best water fight. Groups toting Super Soakers stroll the streets of the Old City to blast at passersby trying to do the same. EDM parties flanked with water cannons are found every turn you take. Occasionally kids and elders might approach you with a bucket of water to calmly soak your head. Such is the party scene during Songkran, the Thai New Year. 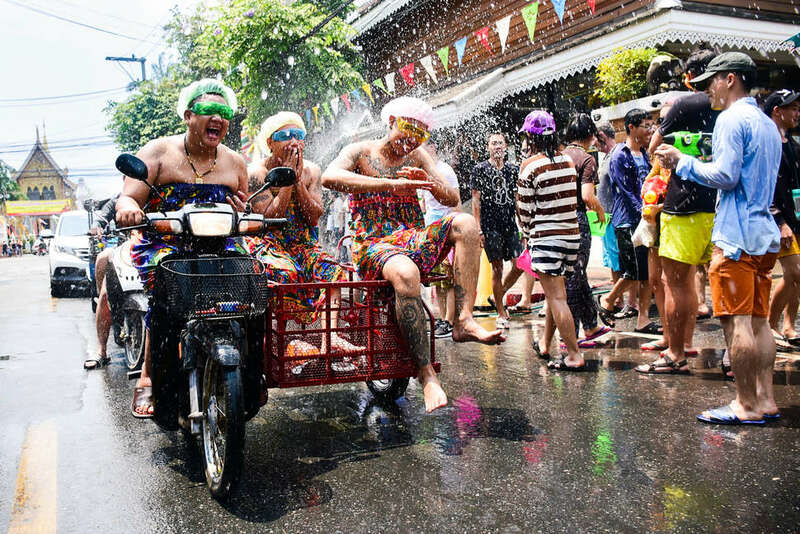 While Thailand's neighbors Myanmar, Laos, and Cambodia have similar new year parties, Thailand's Songkran -- which runs about five days in mid-April -- is an experience particularly special in Southeast Asia's archetypal backpacking country. The citywide parties and never-ending water fight is the symbolic fun time, but the Super Soaker skirmishes are a fun distortion of the cleansing act at the heart of the holiday. Your bucket list probably has a trip to Thailand on there somewhere -- why not spend it in the world’s greatest water war? Out West, the event doesn't have quite the cachet of other country’s cultural celebrations. Yet. Brazil has Carnival. New Orleans has Mardi Gras. Thailand has Songkran, a historic and trip-worthy culture event unto itself. The Buddhist solar new year, whose name comes from the Sanskrit word for "passing," dates back thousands of years -- back to when the Buddha himself doled out wisdom. Put down the water guns and turn down the ear-rattling dance music for a moment to recognize what’s really going on. 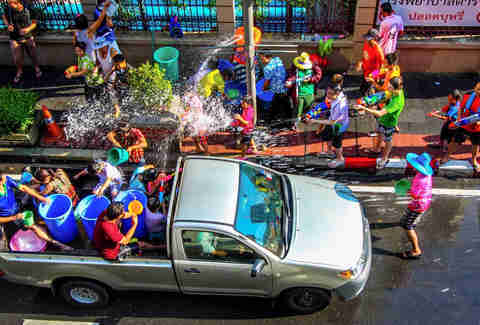 “[Songkran] is traditionally an occasion for family reunions, temple visits, and annual house cleaning. It's time to bring many good things to your life for the coming new year," Kiatlapnachai explains. “Traditionally, Thais perform the ‘Rod Nam Dum Hua’ ritual [pouring water into elders' palms to ask for their blessing]... on the first day of Songkran, which is officially the National Elderly Day. The second day of Songkran is officially the National Family Day. Families would give alms to the monks and spend quality time with family and friends. Thailand may be a long flight from the US, but it’s hardly a mysterious destination. Europeans and Australians have long made the trek for holidays that combine an element of the spiritual with a lot of being young and hot in beautiful settings. The book has literally been written about the 21-year-old ennui-filled experience roaming around the country (Alex Garland's 1996 Gen X coming-of-age thriller The Beach). Bunking up in a hostel dorm with nine strangers who quickly become close travel friends can happen no matter where you travel or when. If you’re on your own and looking to meet people, the ones who live and work where you’re staying are the easiest people to find. As an easy and natural shared experience, Songkran makes a great time to forge new friendships: Let’s go douse some random people and stay cool in the most daunting heat imaginable. Easy. Even if some of the partying tendencies create cultural tension in Thailand, citizens still love to have a good time with visitors. "Thai people are very welcoming," Kiatlapnachai says. "We are very welcoming to tourists all around the world who want to learn about our Thai culture and also to have fun with each other." Joining forces, renting a tuk-tuk, and soaking other swarms of strangers is the prudent move. Last year, I witnessed a couple of brave souls shoot into a tuk-tuk to drench a defenseless group. Defenseless, until the cart stopped, and upward of 10 people jumped out and exacted more than their fair share of revenge. And after the fighting’s done, nothing complements standing in the hot sun better than an ice-cold Tiger beer and, if Chiang Mai is your playground, a comforting bowl of khao soi: a rich curry dish with fried egg noodles -- the most addictive dish in northern Thailand. In Pattaya, swap out the khao soi for som tum (spicy papaya salad). Don’t overcomplicate the job in Bangkok: Find a street vendor and grab some freshly made pad Thai. The city's Chinatown is bustling with dozens of carts that block off a lane of traffic, giving choice overload. Just pick one. And then do it all again the next day. And the next day. Where in Thailand is best to celebrate Songkran? Outside of Bangkok's notorious backpacking hotbed Khao San Road, where celebrations picked up in the late '90s, Thailand's capital is atypically calm during Songkran. The party primarily migrates north to Chiang Mai, where the most traditional celebration occurs. Late to the party/country? Hit up Pattaya, the coastal city to Bangkok's southeast; the festivities last a full week there. There are other great options beyond the prime destination cities. Way down south, beyond Phuket, lies Hat Yai, where Songkran goes down at midnight. To avoid the craziness of Pattaya or the fratty backpacker scene of Bangkok without taking a flight or a 10-hour bus ride, hit up Khon Kaen in the Isan province -- Thailand’s sticky rice capital -- for the Sticky Rice Road Songkran celebration. In any case, be sure to find a city big enough to really have a center of mass, the better for getting your soak on. Staying dry is not an option. You’re going to get wet; accept it. Street vendors peddle their own variations of plastic cases to store your phone and cash, so snag a kit with at least two layers of protection (e.g. a zipper pouch, with a button enclosure over that) to save your gear. You’re also going to want a hat and sunblock -- lots of it. Also, don’t spare any expense on your water gun. Go for the biggest and baddest you can carry. I skimped on a cool one and opted for a small/medium Doraemon hydro-sidearm. It was good enough until the arrival of people toting what felt like bazooka-sized plastic cannons that feel like they’re going to bruise you when the pressured stream hits. Might as well dish out what you’re taking, right? No matter the toy you opt for, just be prepared to be wet all day -- and to enjoy every second of it. Will Robinson is a writer for Thrillist who vows to splurge on a bigger water gun and eat more khao soi for his next Songkran adventure. Follow him @Will_Robinson_.